Did you buy Kindle Fire instead of iPad 2? Media tablet shipments missed IDC's third-quarter shipment projections. Meanwhile iPad lost market share; IDC forecasts greater declines for Q4. The culprit: Amazon Kindle Fire (with a little help from Barnes & Noble Nook). In the battle of price, and vertically-integrated content platforms, Amazon is ready to take a bite out of Apple. That brings me to the question of the day: Did you or do you plan to buy Kindle Fire, or even Nook, when previously considering iPad 2 this holiday? Please answer in comments as well as taking our buying poll. Kindle Fire's big advantage is price -- $300 less than the cheapest iPad 2, at $199. 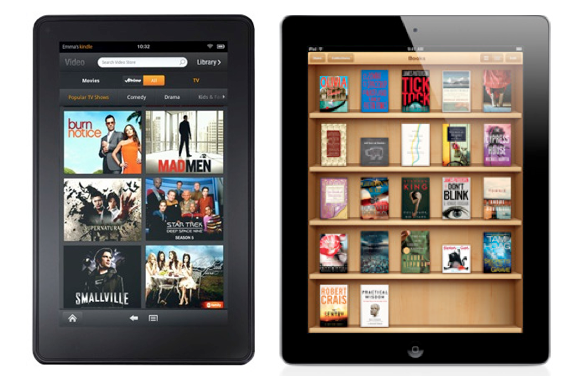 Amazon and Apple compete head-to-head in ebooks, music and movies and curated applications stores. Both command hugely popular brands. Kindle Fire is smaller and doesn't pack a camera, but less also means lower price -- and single one at that. iPads range from $499 to $829. Apple apologists argue the two tablets aren't comparable, which is a ridiculous assertion. Tablets are tablets, the way TVs are TVs. You can say that a 24-inch LCD isn't comparable to a 56-inch model that also connects to the Internet. But to shoppers evaluating by lots of criteria -- price being among the most important -- they absolutely are. Cost is often first consideration for most people, but not always most important, of course. Don't you typically buy the most you can afford? Andrew Eisner, Retrevo's director of community and content, sees a potential "two-horse race between Apple and Amazon" next year in the tablet market. Price absolutely is a factor. Seventy-nine percent of respondents to a recent Retrevo survey said they "would consider buying an Android tablet with similar features over a base model $499 iPad" selling for $250 or less. 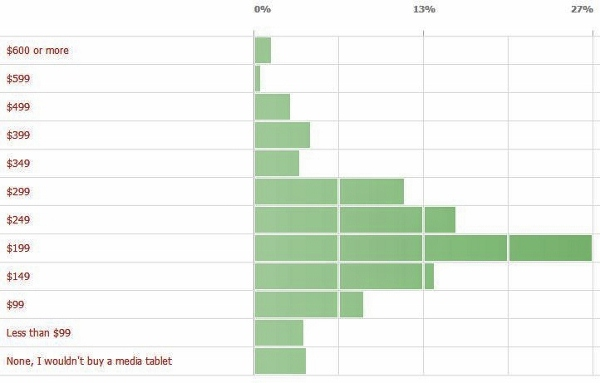 BetaNews' tablet buying poll, with more than 2,000 respondents, is revealing. I included a screen shot of the graph, because it looks like a giant middle finger coming out of $199. There's meaning to that and message to Apple and others selling tablets for more. Forty-four percent of respondents would pay $199 or less for a tablet -- 73 percent $299 or less. "Amazon and Barnes & Noble are shaking up the media tablet market, and their success helps prove that there is an appetite for media tablets beyond Apple's iPad", Tom Mainelli, IDC research director, says. IDC expects a dramatic change in Android market share during fourth quarter, largely from Kindle Fire -- 40.3 percent, up from 32.4 percent in Q3. Media tablet shipments fell 5.8 percent below IDC's forecast, but the company affirms "strong demand" in fourth quarter, raising its forecast to 63.3 million units from 62.5 million. As for iPad, which market share fell to 61.5 percent from 63.3 percent quarter-on-quarter, IDC still expects exceptional performance. But the future is darkening somewhat. "Apple's larger portfolio of tablet-specific apps, upcoming iPad versions, and growing physical store presence in key emerging markets like Asia/Pacific will help maintain its global leadership", Jennifer Song, IDC research analyst, says. "However, an improving Android OS experience and lower competitor pricing in an environment with worldwide economic concerns should help Android to increase its market share". How has Amazon Kindle Fire affected your tablet buying plans this holiday? Amazon didn't ship any tablets in third quarter and HP got a one-time boost from the big TouchPad sell-off. Last week, HP announced the release of WebOS to open source, but "IDC does not believe the operating system will reappear in the media tablet market in any meaningful way going forward". So circling back to where the post started, did you buy Kindle Fire instead of iPad 2? Also: If you've got an iPad already and chose to get Kindle Fire as the next tablet, please share why.